Two nurses from Oak Bay in their field uniform. Photograph courtesy of Jean Sparks, Private Collection. In the summer of 1915, Dr. E.C. Hart raised the British Columbia unit of the Canadian Medical Corps. The British Colonist reported regularly on the recruitment of doctors, surgeons, and nurses for the unit throughout June and July. On 11 July, the Colonist reported that 32 physicians and surgeons and 73 nurses had been accepted, including 29 nurses from Victoria. The unit gathered in Esquimalt at Macaulay point for training in August of 1915. Though women were not able to enlist as soldiers in the First World, they made many contributions as enlisted battlefield nurses. 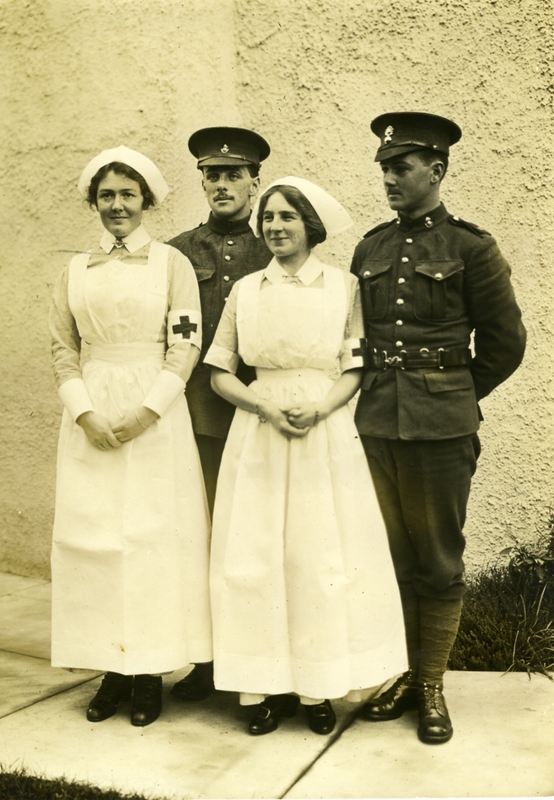 By the First World War, nurses were only accepted into the Canadian Army Medical Corps if they had been trained in a three year program at an established nursing school. Between the 1860s and the 1910s, nursing professionalized and formed a network of educational institutions in Canada; in 1906, nursing students could attend one of seventy training schools integrated into Canadian hospitals. In Victoria, nurses trained at either the Royal Jubilee School of Nursing or the St. Joseph’s Hospital School of Nursing. Many nurses who trained in Victoria joined the B.C. unit, but some joined units elsewhere in Canada or abroad. Evelyn Edwards, for example, returned to her home in Port Townsend, WA to join the American Expeditionary Forces after graduating from the RJH School of Nursing in 1914. Nursing education focused on practical training and students took classes in subjects such as bacteriology, anatomy, children’s diseases, Materia Medica (pharmacology), and dietetics. 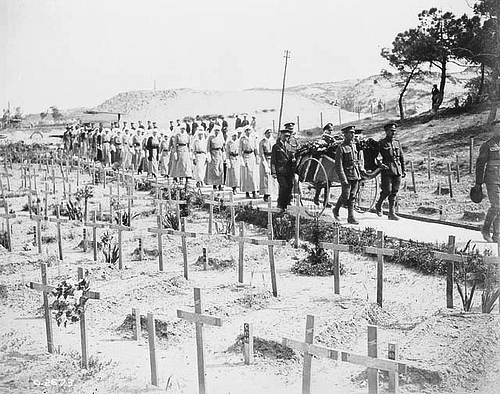 Funeral procession of Nursing Sister Gladys Wake, an Esquimalt resident and graduate of the Royal Jubilee Hospital School of Nursing, who died of wounds received in the bombing of No.1 Canadian General Hospital, Etaples, France, 19 May 1918. Photograph courtesy of Canada. Dept. of National Defence, Library and Archives Canada. Over 100 women from Victoria served as nurses overseas. Excerpts from the wartime diaries two Esquimalt nurses, Lieutenant Elise Dorothy Collis and Lieutenant Mary Ethel Morrison, provide historians with a view into the lives of nurses who enlisted with the Canadian Army Medical Corps. Four graduates of the Royal Jubilee Nursing School were killed in Europe: Christina Campbell and Mabel J. McDiarmid were aboard the Hospital Ship Llandovery Castle when it was torpedoed off the coast of Ireland; Gladys Wake and Jessie Nelson King died of injuries sustained in the field. The image on the left is the funeral procession of Nursing Sister Gladys Wake. She received a full military service before being interred in Etaples, France near the hospital she served in. To learn more about the significant contributions Victorian nurses made to the war, search the Records of Service Database for enlisted women. British Colonist, 11 July 1915 as cited in Maureen Duffus, Battlefront Nurses: The Canadian Army Medical Corps in England, France and Salonika, 1914-1919 (Toronto: Town and Gown Press, 2009), 21-22. Many nurses kept extensive diaries, including two Victorian nurses: Lieutenant Elise Dorothy Collis and Lieutenant Mary Ethel Morrison. Excerpts from their diaries can be found in Maureen Duffus, Battlefront Nurses: The Canadian Army Medical Corps in England, France and Salonika, 1914-1919 (Toronto: Town and Gown Press, 2009). Royal Jubilee Hospital School of Nursing Archives, Evelyn Edwards, student files. Royal Jubilee Hospital School of Nursing Archives, Student files. Great Canadian War Project, http://www.canadiangreatwarproject.com/ (accessed 2 July 2013). Duffus, Maureen. Battlefront Nurses: The Canadian Army Medical Corps in England, France and Salonika, 1914-1919. Toronto: Town and Gown Press, 2009. Great Canadian War Project. 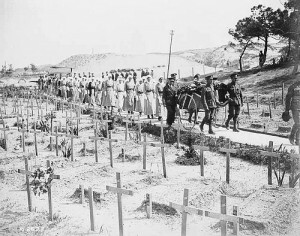 http://www.canadiangreatwarproject.com/ (accessed 2 July 2013). Koolman, Liz. “History of the Royal Jubilee Hospital,” 4 January 2012 http://www.viha.ca/NR/rdonlyres/279A6321-6F94-42FB-ABA4-957D7B54B842/0/history_of_rjh_2012_final.pdf (accessed 1 July 2012). Royal Jubilee Hospital School of Nursing Archives. Victoria, B.C.